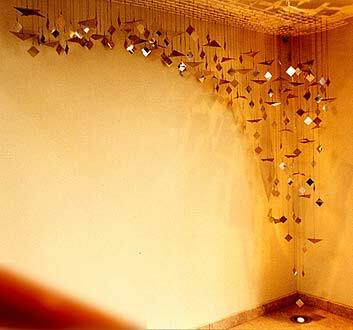 This delicate sculpture brings life into a corner of the entry to this home. Slight breezes move the elements of the work, creating soft sounds, almost of the breeze itself. As the sculpture responds, the uplit elements project an interplay of light and shadow across the space. Here and there in the work are stylized fish forms. Upon each one is inscribed the name of one of my clients' grandchildren. I designed this as a lovely picture of the protective mantle of the family.